Indonesia is the home of sate and it is one of Indonesia’s best dishes. Sate is found everywhere in Indonesia, on roadside carts and in posh dining restaurants. Some restaurants in Indonesia specialize in various kinds of delicious sate. Sate is marinated, skewered and grilled meat served with sauce (commonly peanut and coconut dip). You can make sate with chicken, mutton, fish, beef, squid or even tofu. It is skewered on a stick made out of coconut wood, but today normal skewers are also used. Sate is famous in Thailand, Malaysia, Singapore and in Netherlands where it can be easily bought in restaurants and supermarkets. Cut beef into strips or cubes. Wash well and drain excess water. Mix the tamarind paste, salt, sugar, lemon grass, aromatic ginger, ginger garlic paste and the meat. Leave it to marinate overnight or for at least 8 hours. After the meat has been marinated, place the pan of meat on the fire and cook till the meat is half cooked in its own juice and is dry. Now the beef is ready to be skewed and barbecued. Skew the meat and the other ingredients in the order you like. Roast it over cinders, turning frequently till all sides are slightly browned. Your satey is ready to be enjoyed with some peanut dip. Grind the first six ingredients finely. Pour the safflower oil into a pan and fry the paste lightly on medium heat. Add the rest of the ingredients and bring to boil. Remove from the fire and cover it. Serve it with daging satay. This spicy bbq has many variations in Indonesia itself. There are over 37 different kinds of sate in Indonesia. The different kind of sate are named after the meat that is used to make the sate or after the name of the region where it originated or by the different method of cooking this particular sate. This is a vegetable sate that was made specially for the poor who cannot afford to buy the beef sate. Beef was considered a luxury in those days and the poor would get a taste of sate only through this vegetable sate. Today it is still sold with skewered vegetables and offal. A spicy beef sate which tastes milky, served with hot chili sauce. Boiled quail eggs are skewered and marinated in sauce. It is cooked further to enhance the flavor. This is a rich and spicy sate made with skewered shellfish, often served as a side dish. This is made using chicken liver or cattle liver. The marinated liver is skewered and boiled. This variation is not grilled and is served as a side dish. This is a spicy and crispy sate made with chicken skin. This sate is made from fresh-water turtle. This is served along with shallots, soy sauce and peppers. 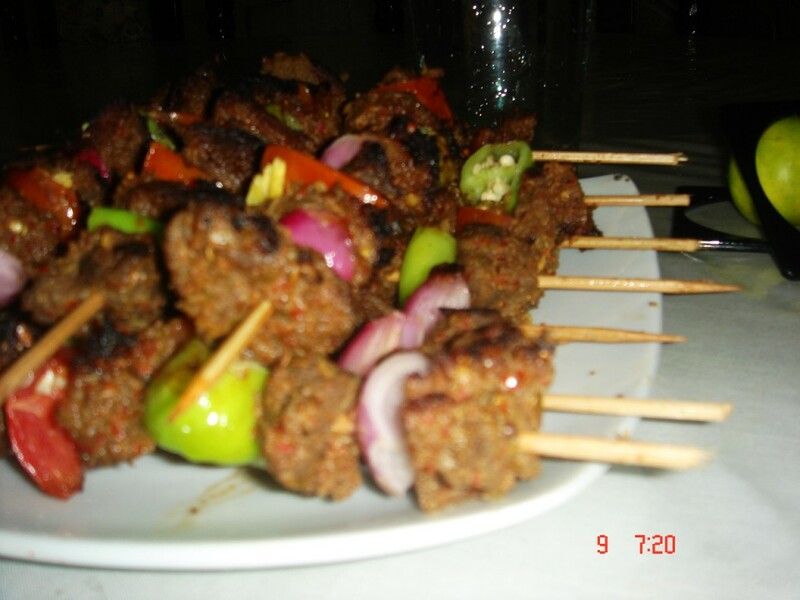 This sate is made with horse meat that is marinated and grilled. Like turtle sate, this too is served with shallots and soy sauce. This is made from the flesh of eels. Each eel is wrapped around a skewer. So, each skewer contains a small eel that is marinated and grilled. This dish is first made by cooking the buffalo meat in sugar and other spices until it is tender. Then this meat is marinated and grilled. This sate is served with sauce and covered using teak leaves to give it a lovely smell. There are a dozen more variations of sate that will leave you exhausted after reading. The best thing we can do is to spend our vacation in Indonesia and book ourselves a cosy room next to a sate restaurent. Then we can enjoy all the different kinds of satey Indonesia has to offer. A country's cuisine should be eaten in that particular country! Hope you enjoyed reading this article. Your comments and suggestions are welcome. Seems to tasty. I'll have to try it. You got to go to MY FEEDS at the top and accept my friendship. I want to message you. Looks delicious! Maybe high in fat, but eaten with a plate of vegetables and whole grains, this could be an excellent main course. Thanks for sharing! Thank you for the comment and your excellent suggestion. It sounds mouthwatering. lets add a glass full of iced orange juice to the menu. I love SE Asian food. Like claudslewis, I thought sate was Thai originally. I'll have to try your recipe, although not the turtle or eel or horse or water buffalo varieties!